The Mercedes-Benz G63 AMG’s 536 horsepower engine, luxurious interior, and extreme off-road mechanicals make it one of the best luxury 4x4s money can buy. “I don’t know if we should take this thing up there,” my driving partner said to me with a grimace as I put the $139,000 G63 AMG into low range and locked all three of the differentials. “Oh, no. We absolutely should,” I chortled back, unable to hide a big grin. Ahead of us stretched a jagged, rock-filled single track that ran over the top a series of mountainous peaks. Despite the low-hanging sport exhaust and AMG split five-spoke light alloy wheels wrapped in performance road tires, I put the boxy German truck back into drive and floored it up the hill. We at Digital Trends are obviously interested in technology. When it comes to cars, we prefer high-concept sports cars that use engineering prowess, advanced ECUs and thousands of sensors to make the driving experience that much sharper, that much more precise. There’s an exception to that, though. And this is it. It’s called the G63 AMG and it’s one of the most wondrous things I’ve ever driven. 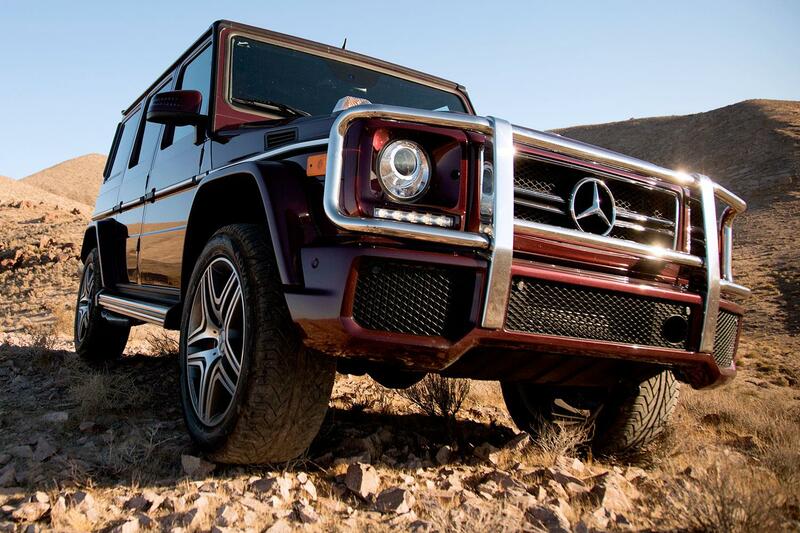 If you didn’t already know, the G63 is the souped-up version of the unruly G-Wagon. Although it’s been updated over and over throughout the years, the G63 is still based upon a chassis designed in the mid-1970s and originally sold in 1979. Delightfully, from the looks of it, you wouldn’t be able to tell. Yes, it has an old-school boxy look, but that design has always been fashionable with off-roaders. So, if you didn’t know the wiser, and went off looks and power alone, you might think the G63 was a modern luxury truck. But it’s not. I’ll come back to that in a minute. So the madmen at AMG take the old G-Wagon and fit to it a hand-built 5.5-liter direct-injected V8 that produces 536 horsepower and 560 pound-feet of torque. To that they bolt an AMG SPEEDSHIFT PLUS 7-speed automatic transmission, which sends power to all four wheels through a mix of rudimentary mechanicals and high-tech tricks. This, too, we will come back to. As a result of the power boost, the G63 AMG will go 0-62 mph in 5.3 seconds and hit a top speed of 130 where it has been electronically limited for your and the planet’s safety. As we feverishly crested the first hill, I let off the throttle and we settled at the top of the rocky mount with a great burble of exhaust and carbons. Where the body flex is frightening on the highway, it’s a godsend on the trails. “See? That wasn’t so bad,” I said, trying to reassure the jangled nerves of my co-pilot. “Sure,” he said hesitantly. “Maybe next time go a bit slower?” He asked. We paused a moment to survey the scenery and I looked in the rearview mirror at the near 45-degree incline we had just hastily ascended. As we proceeded, I took my time and made sure not to score the expensive AMG rims on the rocks. Avoiding sharp stones, I had to veer very close to the edge, into the sagebrush. I rolled the window and took in a deep breath of the now sage-scented air as the sun began to set behind us. I’ve done plenty of off-roading in my day, but never in a car this expensive or luxurious. 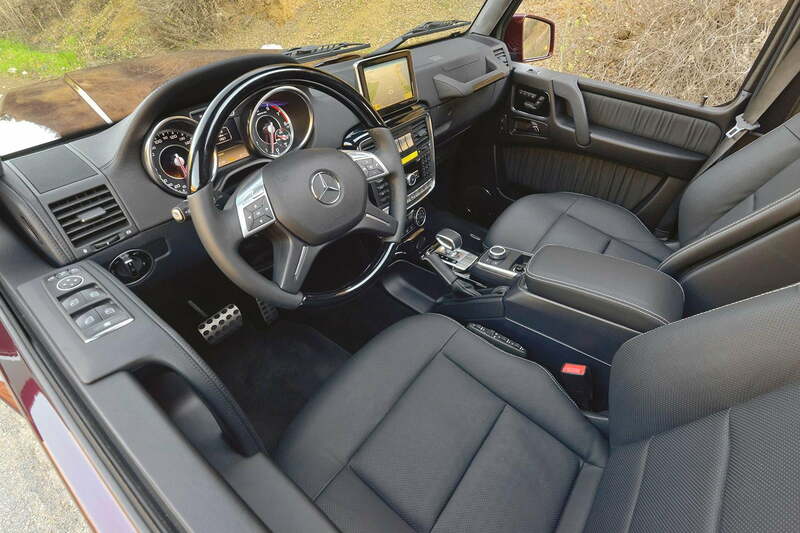 The underpinnings of the G63 might be ancient, but the interior is another story. Mercedes designers fitted this one with the Designo interior package, which made it incredibly opulent. 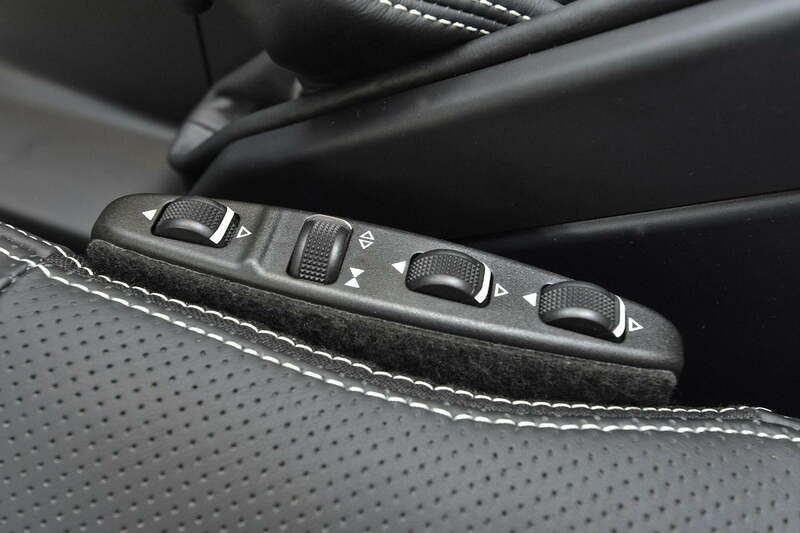 Not resembling any other part of the Mercedes line, you sit nearly perfectly upright, right next to the flat dash, which is covered in the finest German materials. It rides that perfect line between outdated and over done. 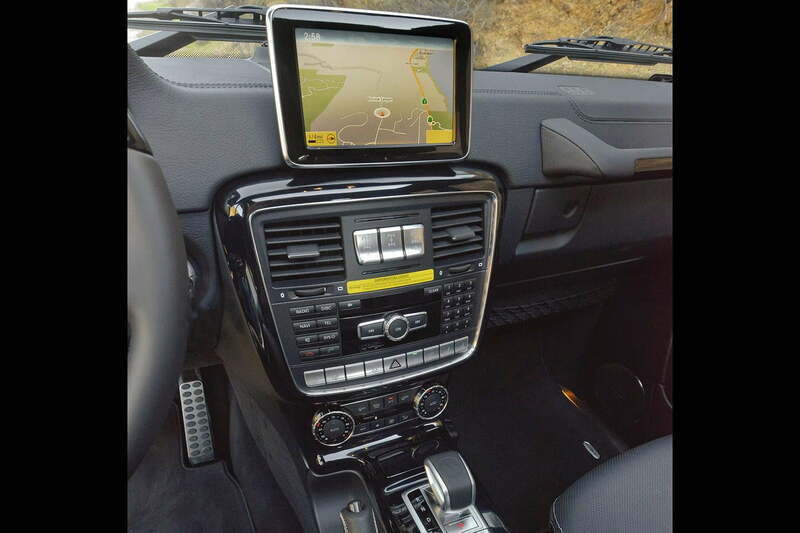 Floating in front of the dash is an infotainment screen, complete with navigation, Bluetooth, and everything else Mercedes buyers have come to expect from the modern COMAND system. Lightly gripping the classically styled wheel, we climbed over hill after rocky hill, through ruts, over stones, and crushing much brush. At each downhill, we’d listen to the engine and the mechanicals do the slowing for us with little use for a brake pedal. While newfangled Mercedes 4x4s feature hill descent computers, mechanical bits and gears slow the G-Wagon. The madmen at AMG fitted the old G-Wagon with a 5.5-liter, direct-injected V8 that produces 536 hp. I love this feature of the G63. While I greatly appreciate modern traction control technologies, it’s the bulky, heavy mechanical bits that I just love. This isn’t the only way the G63 is old; so is the handling. Out on the street, the G63 can pull like the best of them. 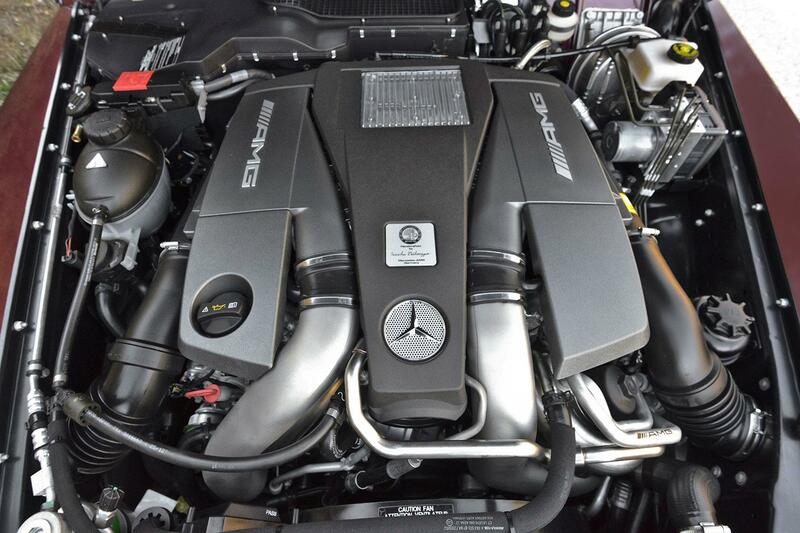 AMG designers also had the audacity to give the boxy 4×4 the exhaust note of the Mercedes SLS AMG. It shouts and burbles, and just sets any motoring enthusiast senses alight. Going 0-62 in 5.3 seconds is no small feat for such an old, boxy car. At high speeds, moving this thing along is very literally like pushing a steel box through Jell-O. The acceleration – as great as it is – doesn’t make up for the handling characteristics. 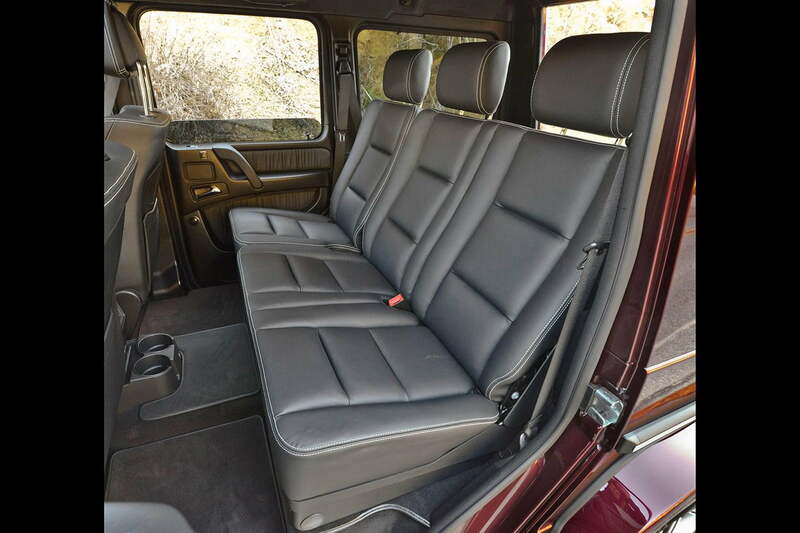 In comparison to the comparably priced, equipped, and capable Range Rover, the G63 handles like an ox cart. It rolls scarily through corners of any degree and at any speed. Luckily, Mercedes has left the auxiliary handle on the dash so the front passenger can white knuckle it along with the driver. Where the body flex is frightening on the highway, it’s a godsend on the trails. After all, this is what the G-Wagon was built for. Confidently powering over boulders, we felt control and in charge, as all wheels remained firmly planted on the soil – or stones. Not so in the G’s competition. The 2014 Range Rover, for instance will often lose a couple wheels off the ground, as its new aluminum chassis is too stiff for old-school articulation. In the back of my mind, I wondered at the beginning of our adventure if the rocky terrain would best the G63. Delightfully – and to my surprise – it never was. It was always in control, leaving us to enjoy the A/C, satellite radio, plush leather, and voluminous interior. When we finally realized we’d be late for dinner, we paused, jumped out of the Teutonic truck and snapped the pictures you see above. When we finished with our photo shoot, we climbed back in, and I had to Austin Powers our way back the other direction on the trail, utilizing the backup camera to execute a 17-point turn. As we raced back toward the highway, I had a new appreciation for the G-Wagon. I had always considered it laughably outdated, no matter how good-looking I thought it to be. Would I say the G63 AMG is worth the $130,000+ asking price? That’s hard for me to say. But after this drive, I know I’d plunk my money down for it happily.